Short URL is a free Windows 8 app available under “Productivity” category of its App Store. 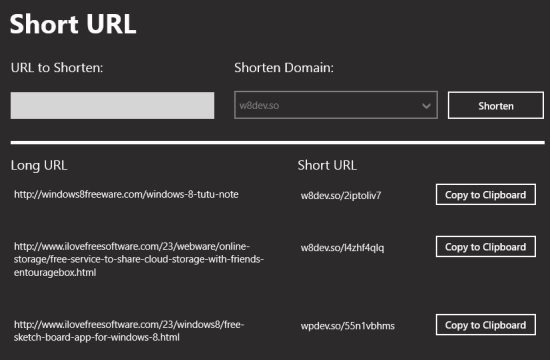 This Windows 8 Short URL app lets you shorten long URLs with ease on your Windows 8 PC. It lets you shorten the URL under multiple domain which includes wp7.so, wp8.so, w8dev.so, wpdev.so, and wpau.so. To shorten the URL, you just have to type or paste the URL and then select a domain under which you want the app to make the URL shorten. Now, click on “shorten” button and the app will make the entered URL short. Well, this Windows 8 Short URL app not only allows you to make the URL short, but it also allows you to copy the shortened URL to clipboard. With this Short URL app for Windows 8, you can easily use the shorten URL anywhere you require it. The user-interface of this Short URL Windows 8 app is simple and easy to use. I am not sure that this app works online or offline. But, I think that it works online. Why Login User And Password? The good part of this Windows 8 Short URL app is that, all the URL which are saved can be easily accessed by any Windows 8 user. This is done by creating a unique login user account and password. Before starting the app, it will ask you to login with the existing user account and password (If you don’t have the username and password to login, then it allows you to create the new login credentials with just 3 steps). The app requires the login ID and password, so that all the shorten URL which are saved can be accessed on any Windows phone or on any Window 8 user. Also, check out our featured post on URL Shorten Apps. Saves all the shorten URL. Access the short URL from any Windows 8 device. Copy the URL to clipboard with just a single click. To download and install Short URL app, then login to your Windows 8 App Store. Now, search for “Short URL” app, and then click on install button. Short URL app makes the work easy by making the long URL short. It is really helpful in the cases where you have a certain word limit and want to paste maximum URL in it. I like the “copy to clipboard” with a single click option. Also, I like the fact that all the saved URL can be accessed on any Windows 8 user.